Of course one can never have too many books, but one can have, too many books waiting to be read. As regular readers of this blog will know, I am guilty of acquiring books second hand, new and sometimes borrowed. I fully intend to read them all, but sadly it just doesn’t always happen. The current pile below includes two volumes of Proust – what was I thinking of! The idea of reading Proust came from listening to the biography of him on Radio 4’s Book of the week. The person who has time to re-read a sentence which continues for three quarters of a page, however beautifully written, because she isn’t quite sure she’s grasped the meaning, is not me. 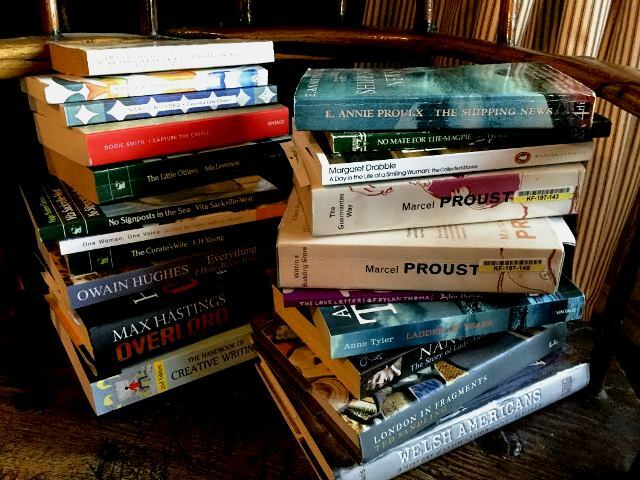 I will put away the Proust until the children have left home, many years from now, I hope. I shouldn’t have included the Anne Tyler novel Ladder of Years, as I finished it yesterday. But, when I woke this morning I had a need to re- read the last chapter, which I will…sometime. I began Dodie Smith’s I Capture the Castle last night; a Christmas present from my husband along with Nancy Mitford’s The Pursuit of Love and Love in a Cold Climate, all of which I’ve wanted to read for years but haven’t got around to. So here I am making my one and only New Year resolution; that is – when that desire to hold, keep and possibly own a book I really want to read comes over me, I must instead, add it to the new list I have at the back of my note book…so far it includes John Updike’s Rabbit books and Patrick Suskind’s Perfume, but obviously nothing in the pile, although perhaps it should. I’m sure I read somewhere a disparaging description of someone who kept a list of books to be read. I don’t care – it is a pragmatic solution for someone who has no time for dusting and needs to spend spare cash on Lego, kickboxing classes, swimming lessons and the occasional Bobby Brown lipstick…although, it is very tempting to ‘one click’ Dinner at the Homesick Restaurant… Anne Tyler is marvelous isn’t she?